Over the course of a high-profile career, Rankin has taken the portraits of the Queen of England, Daniel Craig, Kate Moss, David Bowie, Monica Bellucci and many hundreds more. He has also published around 30 books and been a key driver behind major charity and commercial campaigns for a number of key brands around the world. 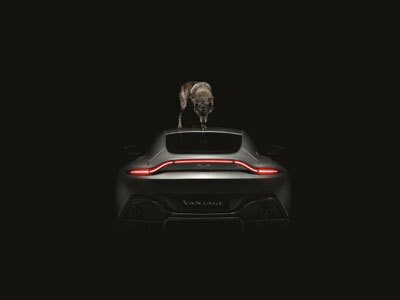 New Vantage is a spectacular Aston Martin sports car with a bold and distinctive design language. Pure, sculptural forms create an athletic, predatory stance, while the minimal front and read overhangs, muscular flanks and broad haunches express the agility and dynamism inherent within the car. New head and tail lights form dramatic new signatures giving the Vantage unmistakable road presence and contribute to a strong and individual identity within the growing Aston Martin model range.